The poster of Parineeti Chopra and Arjun Kapoor's new film Namastey England is out. The actors shared the poster of the film an announced the film's release date - December 7, 2018. 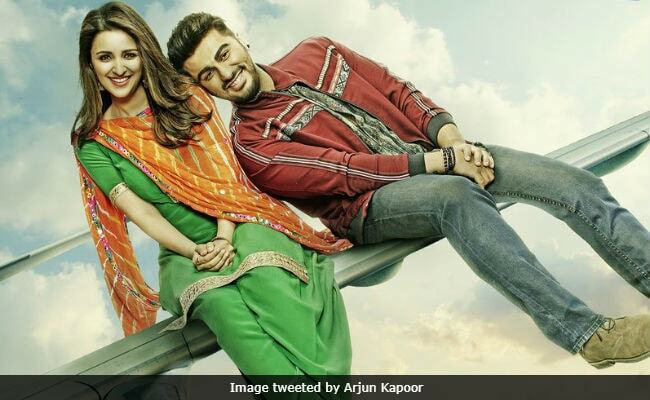 In the poster, Parineeti and Arjun are seen sitting on a plane wing, grinning from ear-to-ear. A tagline in the corner read: "London jana hai leagal illegal sab chalega." Namastey England, which a sequel to Akshay Kumar and Katrina Kaif's Namastey London, is directed by Vipul Amrutlal Shah. "Me and Parineeti are back. Time to fly with us on this wonderful journey from Punjab to England," Arjun captioned the poster. Namaste England went on floors on Thursday in Amritsar, Punjab. Arjun, Parineeti and Vipul Shah started their Namaste England journey with a visit to the Golden Temple. According to a PTI report, the team will shoot in Amritsar and then in Ludhiana and Patiala. The filmmaker earlier told PTI that this is the perfect time to be in Punjab as the weather is neither too hot nor too cold and the crops will make for stunning visuals. Arjun Kapoor and Parineeti Chopra have another film releasing this year, titled Sandeep Aur Pinky Faraar. Of working with Arjun all year long, Parineeti told news agency IANS: "More than me, Arjun should be happy as he will get to spend almost a year with me since we are shooting for two back-to-back movies. I am very excited and looking forward to both the films as he is one of my closest friends in the film industry. I am happy he is my co-star."